Continuing the efforts to bring their software to Linux, Google released a port of their desktop search utility. 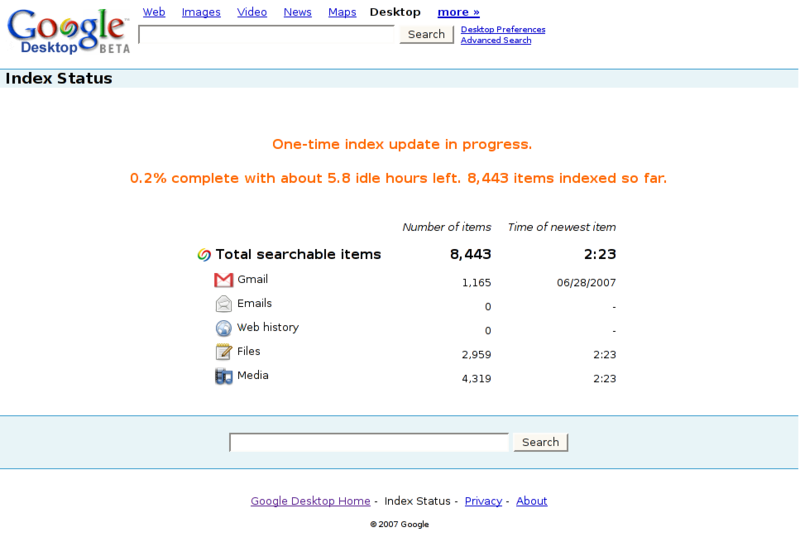 Google Desktop for Linux indexes the files on your computer which leads to almost instant search results. The search results appear as-you-type and the files can be opened by a click on the drop down list. If there are many results they can also be listed in the web browser with an interface that closely resembles Google’s online search. It’s always nice to see a company acknowledging the Linux user base. The indexing process is very light and barely noticable. Google probably shares the same codebase with the Windows and Mac versions so it is fairly proven software. It’s closed source. This isn’t a show stopper for me, but it may be for some of you, and in any way, an open source version would be better. The UI is mainly in the web browser, which means it is rather badly integrated with the desktop. I hope they add a panel applet and other means of integration in future versions. Google Desktop creates a top level entry in the Applications menu. I know no other software (including Google’s Picasa and Earth) that does this and I have know idea why they chose to to this. Google Desktop is one more of those proprietary applications that is now also available on Linux. Whatever your views on “software ethics” are, you probably should agree that this is a good thing. Many people will oppose to using this software and there is nothing wrong with that, but for other people this will lower the barrier to using Linux, and even if it’s only a tiny bit. I, for one, will use Google Desktop from time to time, but what I’m really looking forward to is Google Talk for Linux.